GM Korea, the local unit of the US carmaker, is seeking to regain its rank as the No. 3 bestselling local carmaker here this month on demand for new models and financial support from related parties to stabilize its financial conditions, the company said Friday. GM Korea is hoping to sell more than 10,000 units in June for the first time this year and regain its position as the third top-selling local carmaker here after Hyundai and Kia, based on 3,000 vehicles sold here in the first ten days of the month. Largely contributing to GM Korea’s rising sales is the new Spark compact car released last month. Contracts for the Spark averages about 200 units daily, the company said. “We hope to surpass the 10,000 unit mark in June because the figure would mean that various efforts to foster business is headed in the right direction,” GM Korea’s spokesperson said. Before GM Korea‘s sales slump, it sold about 1,200 units per month. Taking a big step forward in restoring financial stability at the local unit, GM headquarters has completed debt-equity swap on GM Korea’s $2.8 billion loan as of Tuesday, the company said. Following the latest move, GM would receive about 88.9 million preferred shares of the local unit. GM‘s promised investment of some 863 billion won ($787 million) is also underway, which will be used to cover for outstanding bonuses and severances. As for the state-run Korea Development Bank, it will first invest 404.5 billion won in GM Korea to upgrade facilities and product development, and invest another 400 billion won within the year. On such efforts, GM Korea sold 7,670 units in the local market in May, up 42.6 percent from the previous month, data from Korea Automobile Manufacturers Association showed. Last month’s performance, however, remains 35.3 percent less than 11,854 units sold in May 2017. To boost earnings, GM Korea launched Equinox SUV earlier this month rivaling Hyundai’s Santa Fe ranked No.1 in sales in the popular and profitable segment. About 200 units of the SUV were sold in the first day of release. As the mid-sized SUV Equinox is priced similar to, for instance, Hyundai’s Santafe at 29.8 million won and 38.9 million won, market experts said it would be important for the automaker to highlight on the model’s advanced safety features and designs as a benefiting point, if it was to set the sales target as similar to that of Spark, the compact car. 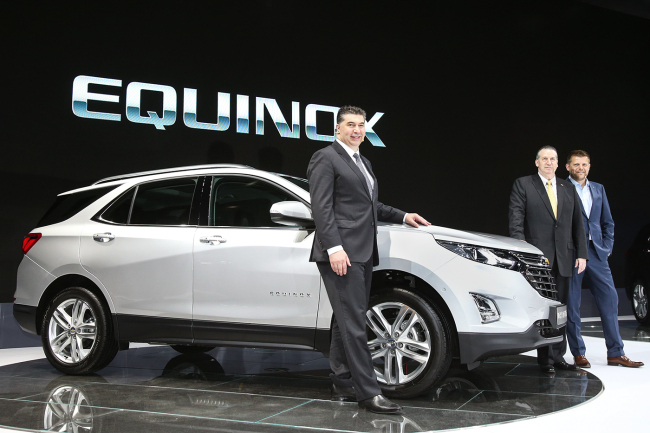 Market experts mentioned the higher-than-expected 29.8 million won and 38.9 million won price range of Equinox, as an obstacle GM Korea has to overcome to garner demand as Spark compact car. Hyundai’s Santa Fe SUV is priced between 28.9 million won and 39.4 million won. “I would say the price difference, you have to look at the value of the vehicle. There are differentiations, with all the safety values, the interior and exterior design,” said GM Korea Vice President Dale Sullivan, during a meeting with reporters at last week’s Busan motor show. GM Korea also has lingering temporary worker issues. The Ministry of Employment and Labor issued a correction order on May 28 for GM Korea to hire some 774 workers who had worked at the Changwon plant. If the company does not abide the order until July 3, it would be levied a maximum 7.7 billion won penalty.